Mmm. I’d love to learn about film photography. A “BIG” annoncement next week huh? I have a BIG announcement scheduled for next week too! What an awesome coincidence! Wouldn’t it be freaky if both our announcements were about film? Actually, maybe not freaky, but awesome! This is probably a really big undertaking, but I’d really like to know the differences between several makes of film. What brand/kind of film gives what look? I’ve tried out several, and I have my favorites, but there are SO many more that I haven’t tried, and know I won’t try for a while. * What’s the practical bits you need to know to use a 4×5 view camera? As in, what small bits and pieces of gear is actually needed and how do you use it for best effect; do you need to install the ground glass yourself, and if so, is there a right way up and a wrong one; what should a complete, functional film holder look like, and how many would you actually ever need in practice; how, exactly, do you actually pack the exposed film for delivery to the lab, and what do they expect of you? What can you expect in terms of resolution and tonality compared to medium format? And so on. * The second question really is the same, except for darkroom use. What should a used enlarger have for gear attached, for instance; I’ve checked a couple out but I have no idea if they’re complete, or if not, if I can get the missing pieces. Or, let’s say, you get to rent or borrow a darkroom for a couple of hours (there’s several places where i live that offer darkroom rentals). What should you bring, and how do you go about making a first print in practice? @Janne: I sure would have appreciated something like that when I started in 4×5! I do love darkoom. So anything related to techniques to use there would be welcome. However, I do believe scanning is v. important. At one moment or another we find ourselves handling digital reproductions of our pics. So I think that practical information on scanning (tips and techniques; how to deal with difficult pics; workflow; different pieces of software; etc.) would be really appreciated by most film lovers. How about a comparison between the best processing labs around the country. Not everyone likes developing their own film. * I have often heared “Push” and “Pull” being used with reference to developing. What exactly do these mean? How do you “Pull Process” or “Push Process”? * Film rangefinders. How can you be sure your image is in focus? Do you just set the distance on the lens and hope your subject in your field of focus? I have seen so many beautiful leica shots and I have always wondered. * Film exposure. 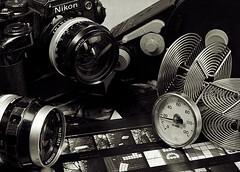 I am lucky enough to have a film camera which meters. Coming from digital this is important as I have had no experience of having to calculate exposure. I am aware of the Sunny 16 rule. But are there any other tricks and tips? In case you have not guessed yet. I am thinking of getting a film rangefinder of some kind to shoot B&W. I will hopefully be able to set up my own darkroom in my next place of residence so any tips on developing would be useful too. i work with film a lot, color negatives goes to the lab but BW gets develloped at home. here’s the problem. allthough i try to keep evrything dust free, i often end up with particles on my BW-film. color film is always clean. So: how do i keep my tank/fim dust free. before developping, do i take certain procedures to keep the dust out? How/where do i let my film dry? do i wipe of the water before drying or not? I’m curious about people film workflow. For instance, I don’t print. Heresy to some perhaps, but I develop, scan, then possibly manipulate via software (curves, b&w conversions etc) to prep the image for digital display. Even further, I’ve taken the scans, submitted them online for printing. So, what is everyone else doing with film? I’d be interested to know if there’s a way to develop film without having to set up a dark room. I’m a student renting a room – I don’t even have a bathroom of my own. Can it be done using a changing bag or something? Any low-footprint tips or tricks would be helpful. I love that you have so many people interested in film………….that’s all I knew for several years! But for Adams question, I can’t help but answer………you can use a changing bag and it doesn’t require you to black out a room. Freestyle Photographic Supplies (Freestylephoto.com) has lots of film, papers, chemicals, equipment for all your photo needs. I’ve ordered from them many times and have been happy with everything! I also go to the darkroom 3-4 times a month to print black and white photographs, its great to “see what happens” in the developer! I’m highly tempted to give some short answers to some of the questions already. Would you prefer I stay quiet and just leave the comments for question? Well, I can’t stop you from answering the questions right here. I’m personally refraining from answering because my intent was to take these questions and turn them into blog posts in the near future. I’m interested in the same thing as Adam. I’ve shot film for a number of years and only switched to any form of digital a year ago. I still shoot film and picked up a used Paterson tank on kijiji a little bit ago. All I want to do is develop the film to negative and then I scan from there. What do I need in addition to the tank? Do I really need a timer? Any differences between processing 120 and 135 of the same film type? Yah, film lives! I teach a darkroom class here in the Los Angeles & my enrollment continues to grow. It’s exciting to see students get such great deals on used film cameras, learn to use the cameras & take great shots and learning the darkroom process. I continue to work thru my archives of negs that I’ve shot over the eons, nothing more satisfying than turning out a high quality print or during the evening class while assisting students with their printing skills. The most common questions are about how to get the correct exposure, using the light meter, depth of field & shutter speeds. And then how to get the best print. can someone gives me a beginner tips for it? cause unlike D-SLR..every shot counts in here,..
My workflow is a lot like Bjorn’s so my frustration right now is scanning, as you know. I’d also like advice on different labs around the country and the qualities and characteristics of different films. The other area I’m interested in is night or low light photography. I did this a lot with my digital camera and am not sure what areas I need to approach differently. I’m sure I’ll think of many more to come. If only there was an online home for film users to interact. Oh well, maybe next week. wow some good questions here. I for one would like to know a little more about toning and bleaching prints as final steps in a workflow or any other advanced printing techniques. Also there are quite a few topics above i could quite competently write about, if Epic edits is looking for a post or two i would be more than willing to help out. Check out my blog and tech articles for my writing style. Great question on toning of prints… I’ll definitely touch on that at some point. If you’d like to write about film photography/darkroom stuff, check out my new blog (http://www.feelingnegative.com/) and get in touch with me via email about post ideas. We’re more than happy to have guest posts on either of these two sites.